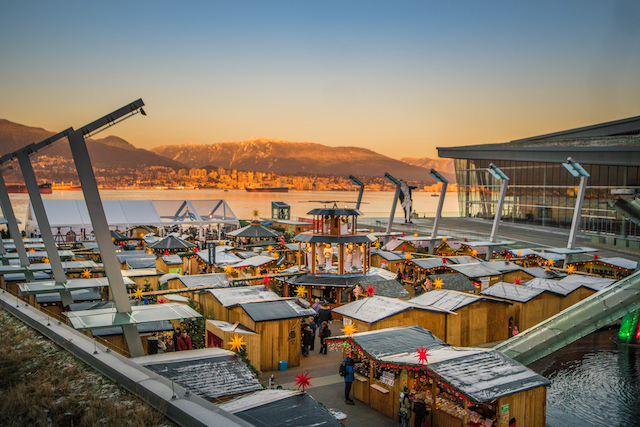 The 8th annual Vancouver Christmas Market is in full swing at Jack Poole Plaza, with an expanded 55,000 square foot site filled with festive German jubilation. The treasured holiday tradition features more than 75 huts stuffed with sweets, treats and gifts, coupled with a multitude of festive family activities and live entertainment. Purchase online to receive a complimentary Season Pass and to get Express Line access. The tradition for John and me is to enjoy the live music, pick up a cup of mulled wine, devour some schnitzel, then shop for ornaments. Among this year’s expanded highlights will be Canada’s first-ever Walk-In Christmas Tree: a 30ft tall tree covered with 36,000 twinkling lights that guests can enter to experience a spectacular – and Instagram-worthy light display. The Vancouver Christmas Market and Children’s Wish Foundation have partnered for the 2017 season in order to raise funds to grant the most heartfelt wishes of BC children diagnosed with a life-threatening illness. During the market’s ‘Children’s Wish Week’, from December 16 to 24, Children’s Wish will be collecting donations and selling ‘wish wands’ at booths throughout the market. Their mascot ‘Roary’ the lion and representatives from Children’s Wish will be onsite December 16 and 17 to help bring the magic of a wish to the Vancouver Christmas Market. Those who generously make a donation at the ticket booths will receive a complimentary Season Pass to the Vancouver Christmas Market. Candy Meister offers a wide selection of colourful, scrumptious, all natural, gluten, dairy and corn free candies from Germany. Quirky handmade greeting cards that cleverly pair adorable illustrations with playful puns. The perfect gift for a loved one this season. Vancouver-based company supplying delightful naturally fused and infused olive oils and balsamic vinegar. The ideal treat for tea lovers, these wonderfully soothing Christmas blends will keep you warm on chilly days. Based in Winnipeg, The Hartmont Candle Company features unique handmade 100% soy wax candles with wood wicks that crackle as they burn. Locally handcrafted, this beautiful wooden pen is produced from Canadian Maple and exotic woods from all over the world. Bring your pen back to the market to get it engraved and personalized. Bright and fun, Yo Sox’s Christmas socks will your keep feet stylish and cozy this winter. 4Cats is a place where people of all art experience levels come together to play and create. Get imaginative with this mini craft kits. Using only the highest quality fabrics, Polar Piece provides comfortable clothing that is 100% Canadian made. Celebrating over 50 years in business, Käthe Wohlfahrt is Germany’s top ornament and Christmas décor company. Take the spirit of Christmas home with this elegantly designed ornament. Prepared using the finest ingredients, Zotter Chocolates has over 400 delicious and rare flavours to choose from. From classics like Milk Chocolate to creamy Butterkaramell there is something for everyone to enjoy. Satisfy your sweet tooth with mouth-watering gingerbread men on a stick. These special Herrnhuter Sterne mini stars are part of a long-standing custom in which families assemble stars together and hang them to decorate and brighten their houses. Try making the Vancouver Christmas Market’s signature Glühwein at home with flavourful mulling spices from Kelowna’s The View Winery. Splendidly sweet and tasty, Honeybee Centre’s honey is pure and comes directly from their bee farm in Surrey. This family-owned business is proud to feature 30 internationally awarded spirits made with only the best local grains and fruits. Their drunken cherries will liven up any dish or drink this holiday season. The Captain and the Chef look forward to welcoming you to their Spätzle Haus. They hand-make their fresh herb Spätzle (egg noodle) with a traditional German recipe like Oma (Grandmother) used to make. I will draw one winner at 9:00am on Friday, December 15, 2017. The prize package will be available for pickup at the Vancouver Christmas Market under the winner’s name. Follow along on Facebook and Twitter for more information this season. Update The winners is Bree Riddell! You had me at mini stars! and have shopped at many of these vendors over the years – what a fantastic prize package! It looks like a lot of fun (I didn’t realize it was on for more than a weekend), and what an awesome gift basket! This is the ultimate ultimate giveaway! What an awesome prize!! Thanks for the chance. What an awesome prize! I love the Vancouver Christmas Market! I hope I’m lucky enough to win this prize pack this year! All of these vendors are so wonderful and it would be so great to promote them!! What a fantastic prize for Christmas! Thank you 😊💭🎁🎅🎄😳 how exciting! I havent been to the market but i passed by it with Jennifer & Gavin looks like fun for the whole family. Happy Holidays miss604. 😍 I can’t wait to go to the Christmas market, this would make it absolutely incredible! Everything in this prize pack is awesome! Merry Christmas! Oh wow! This would certainly help with my Christmas shoppin! Thanks for the chance! What a great prize pack! Happy holidays! What a fun Christmas prize pack! Amazing prize pack, so many cool vendors. You had me at mulled wine. What a wonderful prize to win. I can’t wait to go to the market. I haven’t been to this Christmas market before, but I sure would love to check it out – sounds amazing! What a delightful prize. I may even share it if I win! Count me in for spatzle any day of the week! Lovely! The Christmas market is so much fun! Would make our Christmas to win this prize pack! Awesome prize…we haven’t been to the Vancouver Christmas Market yet! This contest definitely jingles my bells! What a great prize…fingers crossed! Love the Vancouver Christmas market! The Christmas Market… the greatest place for getting into the Christmas spirit… I visit every year to get creative ideas for my students! The Christmas Market is the greatest place for getting into the Christmas spirit… I visit every year to get creative ideas for my students! Our family loves going to the Market! What a great prize. Gotta hit the market soon. Looks like fun. Oh so many great items in there. The Christmas Market is one of my favorite holiday traditions we started about 3 years ago…..love this prize!! What a wonderful prize pack, so many nice Christmas gifts. Amazing – it all sounds so lovely. I can’t wait to go to the Christmas market, it looks lovely and the prize is amazing. Would really help with those last minute gifts! This is a fantastic Christmas gift, and a great market. Some really great items. I’d love to try them. A perfect early holiday gift! That would be so amazing! I have never been to the Christmas market! This is such an awesome prize! Already been to the market and love it! Would love to win this prize pack!! Those are really nice goodies! Sure wish we had a market. As such in Chilliwack BC. Love to visit the different shops. Thank You so much. I will gift to my daughter’s new family if I win. This would be great! I haven’t been to the market yet this year. Wow, what a fantastic prize package! I’ve never been to the Christmas Market either so I’d love to win this. What a wonderful prize. Such a nice variety of products. This is a wonderful contest…so many goodies! Thanks and good luck all! I’ve been once already this year, but planning a repeat visit as there’s so much foods to sample and enjoy. I love my boot mug that I picked up. Thanks for the chance,would love to win!! That would be a lovely Christmas gift! Thanks for the chance! This would be amazing to win! Haven’t been yet!! I love all the products and the Christmas Market is a wonderful family tradition every year. Would love to take my parents to the market – can’t believe they haven’t experienced the magic themselves yet! I would love to take my family! SO MUCH FUN! This would be awesome to win!!!! This would be such a great prize to win. Would love to go to the market to find my German parents some authentic Germans gifts. We are from Singapore, here for 6 years and never been in there, will love to have a peep! Sounds like a great prize to win for Christmas!! I recommend the Vancouver Christmas Market to all of my out of town friends. Such an amazing experience. This would be so much fun. I havnt been since it changed locations. Hopefully this year. 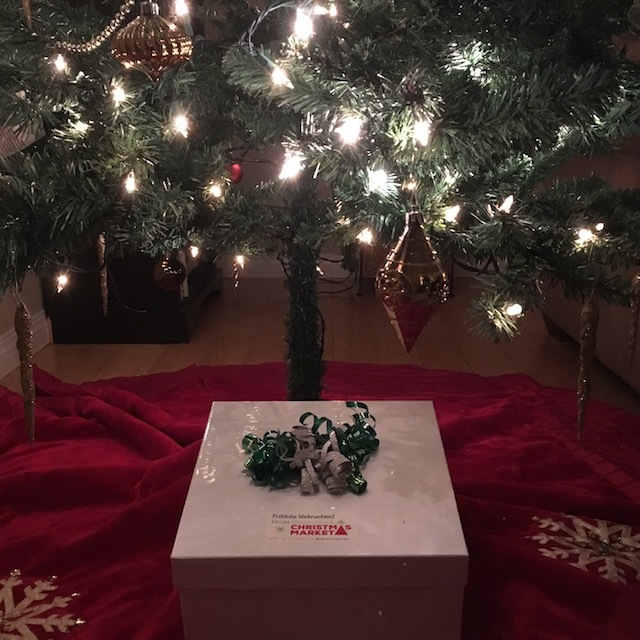 Such a generous and thoughtful gift box! Much luck to everyone who enters the draw!!! Been wanting to go to the Christmas market forever! Wonderful Christmas prize! We visited the market tonight and had a great time. Thank you for holding this contest. What an amazing prize package, all the best of Christmas! Oh how wonderful this would be! Would love to share all these with my family. This would make our Christmas bright. Vancouver Christmas Market is awesome! Everything in this prize looks amazing!! Love the Christmas market. Little piece of home! I can’t wait to go with my daughters! Wow that prize just keeps going!! Ultimate xmas in a box!! What an amazing prize! Fingers crossed. This would make my Christmas! What a great idea! Looking forward to seeing the Market this year! Here’s hoping with all of my might! This sounds like a wonderful gift 🙂 would love to share with friends and family! Lovely market to take myGerman friends to! This is my favourite Christmas Market! I wanna win this season! I hope I win the contest. Vancouver Christmas Market is good place to see. What a generous prize package!!! I hope that whoever wins has a happy holiday and enjoys their phenomenal prize! We would love to win this amazing prize package!! Id love to win this package. My daughter and I enjoy the market every year. She used to live in Germany and misses Christmas time there. I would love to win this and bring my boyfriend to the market!! Wow, such a great prize – absolutely love the christmas market!!! I’ve never been to the Christmas market. Sounds like fun. This would be an amazing prize to win!! Thanks for the opportunity!!! This would be great! Merry Christmas! We love the Christmas market! Fabulous prize! Would take care of a few presents for people on my list!!! Wow! Great prizes. I’d love to win. Amazing prize!! Merry Christmas! Frohe Weihnachten! Would love to win this amazing package! This is truly the ultimate Vancouver Christmas Market gift box! All of those prizes sound interesting. Mmm…I would love to sample these products. Liked, tweeted, following. I would love to win this to surprise my lovely elderly German neighbor. She would be over the moon with German Christmas treats! We have never visited the market and would love to see all of the amazing items the vendors have to offer. Would love to go. Havent been to the new.location yet. Love to take my mom and daughters again. I love the Christmas Market! Would be wonderful to win this prize pack and share the gifts around to friends and family! Wow!! Haven’t been yet this year, but I would love to go this weekend!! Need to get my Spaetzle on! I would love to win this and share the goodies with friends! What an awesome prize! Love the Christmas Market!! Incredible gift in this wonderful time of the year. Would love to win this and share it with my hubby! Wow! I would love to win this amazing prize! I went earlier this season. The food is amazing and found so many fun gifts. So about the food. Would love to finally make it to the market this year we all need some Christmas cheer! I would love this! Liked & shared on FB. Yes please. Would absolutely love this and loooove the Christmas Market! This is an incredible prize package I would love to share with family and friends. Sounds amazing – I’ve never been to the Christmas market. There are some wonderful treats in the prize box! Ohmygoodness! Christmas magic all in a prize pack! 🎄🎁🎄 looks amazing! All I want for Christmas is the Vancouver Christmas Market Gift Box…. the ultimate prize! We went last week and had fun eating and drinking mulled wine ! Love to go back !